Welcome to the last week of term. I know school holidays can bring a whole new set of problems occupying children, but I really look forward to not having to make school lunches!! This week, we are going to focus on measuring and weighing in maths. We'll work on discovering ways to do this and see how our multiplication and basic facts knowledge are linked to these concepts. We'll be working closely with B3 in these activities so as to have mixed ability groups and give us more opportunity to communicate. Towards the end of the week, we'll look at probability. I am also hoping to find time to learn how to introduce ourselves in Maori, using an activity we started last week, related to Matariki. 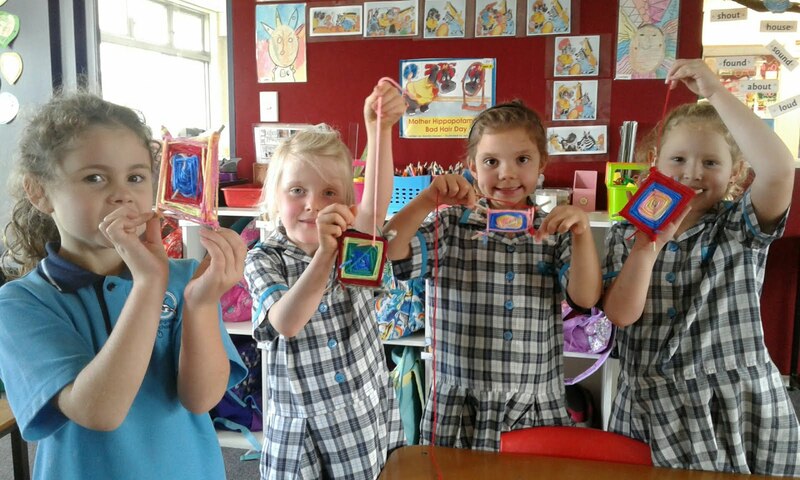 Here are Jessie, Isla, Olivia and Gabi with the Matariki stars we wove last Friday. Our production practices will be longer this week and are moving to the hall as we enter the final stages of preparation to perform. When you do have spare time over these holidays, I have a small project for the children. Could they please find a stone that fits into their hand and that really appeals to them? It should be heavy and smooth as we will decorate them as an art project. I have plenty in my garden and will be keeping an eye out on my dog walks so there will be spares at school, if they haven't found one. I have just found the 'shoot key' for the school photos in Robert's bag....all the B4 children have theirs in their book bag, in case you haven't see yours yet, either! Assembly on Friday will begin at 2.15 and school finishes at 3, as normal.